Bitcoin @ $286 Good Value Or Good Riddence ? Analysis: Bitcoin Price Crash Below $300 – How Much Lower? Sunday trade brought the Bitcoin price below $300 across the BTC/USD exchanges. Price dropped to $275 at Bitstamp before climbing back above $300. Additional downside may still be possible, but there is strong evidence that the bottom may have been struck. Confirmation of a bottom will be covered in CCN’s daily analysis articles during the coming days. As always, stay tuned to CCN for the latest Bitcoin price analysis. It is ten months to the day since China’s PBoC announced restrictions on the exchange of Bitcoin. It is a popularly held belief that this event had preempted the Bitcoin price decline. However, few people are aware that the all-time high occurred five days earlier on 30 November. The Bitcoin price had already been declining for five days when the news came out of China. Also read: Why the Bitcoin Crash Below $500? The current wave, wave E of wave IV, is counted as a (flat a-b-c) correction. Wave E has the same function as wave C, which, in this context, is to progress the downward corrective trend. They share similar wave patterns in their respective c subwaves, although subwave c of wave E is more complex and has, therefore, taken longer to cover the same vertical distance. A benefit of wave E being complex is that it is well articulated despite having wasted a lot of time hopping trendlines. Wave E is counted with the interpretation that it’s 5th subwave had extended. Comparing wave C and wave E it can be seen how they have similar subwaves, despite their different wave counts. Had subwave b of wave C been less pronounced, it might have been possible to count wave C in a similar manner to wave E, but the deciding factor is their overall structures. Wave C is best-described as a zig-zag and wave E as a flat correction. Regardless of subwave counts, the larger correction fits both the look and the rules of a corrective triangle. Wave E has struck the lower trendline in the Bitstamp; BitFinex and BTC-China charts and the wave count above argues that the decline had completed at $275 (Bitstamp). However, BTC-e has not found the lower trendline at it’s low of $287.00 and may still go after it – thereby implying that all the exchanges have additional lows to come. Wave E may print “throw-over” past the lower triangle barrier – something that occurs frequently at the end of a triangle correction. The Bitstamp chart, below, shows that $260 and $200 still present decline targets, as well as a long-term ascending channel trendline presently cutting through $170. However, with the way price had settled above $300 earlier today only to be pushed $25 lower (within minutes) due to the onset of heavy selling… any arbitrary low is possible with these centralized exchanges. Hopefully, the last low ($275 on Bitstamp) was low enough for the majority of market participants. The relentless decline of the past few weeks means that price must now advance for some time – if anything to reset indicators and bring some relief to the market. If the Bitcoin price is indeed at the start of advance then, the first objective of price will be to establish trade above $300. The next step is to tag the 20-period moving average on the 4-hour chart (currently at $347) and then to establish trade above that and approach the 200-period moving average (currently at $430 on the 4-hour Bitstamp chart). Once above $400 – and maintaining advance above the 200MA – only then will we have confirmation that the advance is underway. That is unlikely to happen before the full moon on 8 October. In the meantime, catch possible new lows with exchange buy orders at $260, $200 and the lower channel trendline. The probability of advance increases if price can hold above the $300 psychological level. However, don’t be too aggressive buying into the market as price initially climbs atop $300 and begins rising – it will retrace soon enough and the manner in which it does that will tell us more about its intentions, as well as allow us to determine targets to the upside. CCN hosts a summarized Economic Calendar showing the week’s main data releases. Readers can follow Bitcoin price analysis updates each weekday on CCN. In-depth analysis articles are published every Sunday. The writer is fully invested in Bitcoin via BTC-e and Bitfinex. Trade and Investment is risky but not as risky as some other things out there. Take care only to take action in the market when you are 100% sure of the outcome. CCN accepts no liability whatsoever for losses incurred as a result of anything written in this Bitcoin price analysis report. Fred Ehrsam, left, and Brian Armstrong, co-founders of the bitcoin brokerage Coinbase. Brian Armstrong and Fred Ehrsam certainly look like the kind of guys who could help bitcoin recover from its wild years. They are tall and textbook fit, and as poised as Swiss bankers -- Vulcan Swiss bankers. Armstrong, 31 and a former software engineer at Airbnb Inc., shaves his head. Ehrsam, 26 and a former foreign-exchange trader at Goldman Sachs Group Inc., keeps his hair short and very much in place. When they discuss bitcoin, they rarely smile. Do not try to make them laugh. Their seriousness is understandable, Bloomberg Markets magazine will report in its November 2014 issue. Armstrong and Ehrsam are the founders of a startup called Coinbase Inc., whose mission is to convince everyone that bitcoin isn’t an Internet scam or a libertarian plot against the government or a digital version of goldbuggery, as various skeptics have it. Rather, it’s the best thing to happen to money since the Lydians started minting coins sometime in the seventh century B.C. Coinbase isn’t a bank -- technically, it’s a brokerage -- but in important respects it behaves like one. Customers open accounts, through which they buy bitcoins for dollars. Coinbase holds the bitcoins. Customers spend them using a computer or a smartphone application. Coinbase makes money by charging a 1 percent fee for exchanging dollars and bitcoins. All other transactions are free. Coinbase’s aim is to take a curio currency that exists only as bits on the Internet and turn it into a coin of the realm -- every realm, because part of the appeal of bitcoin is that it can cross borders as easily as e-mail. Before and since, there have been numerous bitcoin heists, blamed on hackers, and more than a few bitcoin losses -- people literally lose their bitcoins by misplacing the code that proves ownership. If you do that, there’s no reset, no more than if you drop a $100 bill through a sewer grate. “Right now, it’s just about making people feel safe and secure,” Ehrsam says in an interview at Coinbase’s headquarters. Coinbase looks like a startup, with rows of industrial-sized Apple computers on Ikea tables, except that it’s on the 26th floor of a building in San Francisco’s financial district, nestled among the very banks bitcoin lovers love to hate. Bitcoin is worth a makeover, Armstrong and Ehrsam say, because the currency solves so many problems that come with putting old technology, in particular credit cards, on the Internet. When consumers use bitcoins, merchants pay fees that are a fraction of what credit card companies get. Users can shop online without giving their names, never mind credit card information -- which, yes, explains Silk Road but also allows noncriminals to claw back some privacy. As for security, the bitcoin system has thwarted every attack thus far. Recent hacks of Target Corp. and JPMorgan Chase & Co. show how the old forms of payment and transfer are ripe for replacement, bitcoin believers say. Coinbase is a bitcoin blue chip. Armstrong and Ehrsam have scored money and support from Y Combinator, the hyperselective startup booster in Silicon Valley. New York–based Union Square Ventures led a $5 million investment in May 2013, and Marc Andreessen’s Menlo Park, California–based venture capital firm, Andreessen Horowitz LLC, anchored a $25 million B round in December. Andreessen may be more stoked about bitcoin than anyone else in techdom. He says it fills a void in the Internet that has existed since he and his friend Eric Bina invented the first widely used Web browser in the 1990s: a protocol for payments. He always imagined that someone would figure out how to send money as easily as data. Like many West Coast entrepreneurs, Armstrong and Ehrsam relish cutting out financial middlemen and have a special scorn for credit card companies. In Armstrong’s view, they entice customers with airline miles, then fleece merchants with fees. “This is the way they’re innovating, playing these games,” he says. Such fees add up to a big opportunity for bitcoin. Credit card and debit fees in the U.S. totaled $72 billion in 2013, says Gil Luria, an analyst at Wedbush Securities Inc. in Los Angeles. Much of that could vanish if bitcoin catches on, he says. Bitcoin arrived in the world on Halloween 2008 in the form of a nine-page white paper called “Bitcoin: A Peer-to-Peer Electronic Cash System,” authored by Satoshi Nakamoto, a person or group of people who remains anonymous. Nakamoto unleashed the bitcoin software, all of it public, in January 2009. The system allowed for the creation of 21 million bitcoins, total, with the last ones to be released in 2140. Bitcoin lets commerce happen without an overarching authority, be it a bank that clears transactions or even a central bank that controls the money supply. It works because each bitcoin is really just a slot in a huge, peer-to-peer online ledger -- millions of slots, really, because each bitcoin, worth $373 as of yesterday, is infinitely divisible. The smallest unit so far, eight places beyond the decimal point, is called a Satoshi. It was worth about 0.0004 cent as of Sept. 18. Electronic currencies had been proposed before, but no one could figure out the double-spending problem: You can’t spend the dollar in your friend’s pocket, but you could spend the same electronic dollar twice if you gave it to two people at the same time. Nakamoto found a solution. No bitcoin transaction is legitimate unless it comports with all of the preceding transactions for each bitcoin involved. Every transaction for every bitcoin is available to every computer that joins the peer-to-peer network that runs the bitcoin system. Buy a watch on Overstock.com, one of the biggest retailers to take bitcoins, and the system goes to work, checking the common ledger for past transactions that prove you have the money. The purchase isn’t done until all the computers on the network agree. Why does anyone devote any time to checking transactions? Because programmers earn new bitcoins for the work -- if their computers also find, by trial and error, the solution to a complex equation that the bitcoin system automatically makes harder as more computing power goes to work on it. This hurdle is designed to prevent a rogue programmer from hijacking the system. Taken together, the checking and solving is called mining bitcoins. In the beginning, people were able to mine bitcoins on desktop computers. Now, it takes huge rigs built on special chips and running in places, such as Iceland, where the electricity needed to power the machines is cheap. That magical ledger is called the blockchain, and there is no word more exciting to Silicon Valley venture capitalists these days. Andreessen and others say the blockchain could be used to keep track of not just money but anything that needs third-party verification, such as real estate contracts or stock trades. It might even track voting and guarantee one ballot per person. On a website called Proofofexistence.com, it’s possible to turn a document like a lease, or even a novel, into a hash -- a code generated by an algorithm -- and load it into the bitcoin blockchain, proving that it existed at a certain time. Armstrong was an early adopter of bitcoin technology. After growing up in San Jose, California, he graduated from Rice University with bachelor’s degrees in economics and computer science and a master’s in computer science, all in 2005. He worked in information technology for Deloitte & Touche LLP and then returned full time to a company he had founded in college, called UniversityTutor.com. He joined Airbnb, the online lodging company, in 2011, and set to work building the company’s anti-fraud system. While there, he saw how hard it was for Airbnb to handle payments from around the world. Then he discovered the Nakamoto white paper and was dazzled. Here was a currency that could fly across borders via an e-mail. Proficient in a babel of computer languages, he built a digital wallet to hold bitcoins on Android phones. Already, the idea was to make bitcoin accessible, to mainstream it. He thought there was a company in this. He applied to Y Combinator. The founders of Airbnb and Reddit Inc. went through Y Combinator, as did Justin Kan, founder of the gaming platform Twitch Interactive Inc., which Amazon.com Inc. bought in August for $970 million. Armstrong finished Y Combinator that June, formally launched Coinbase and went looking for money. He called on Adam Draper, son of venture capitalist Tim Draper. Adam was in the midst of starting Boost VC, a Y Combinator–like accelerator in San Mateo, California. He wanted to invest across categories but also to develop a specialty. Draper had heard about bitcoin. Its promise became apparent, he says, after he met Armstrong at Red Rock Coffee in Mountain View, California, a hangout for caffeine-seeking coders. They talked amid the clicking of keyboards. After hearing Armstrong out, Draper invested his own money in Coinbase and six months later decided to have Boost focus on embryonic bitcoin companies. He wants to fund 100 of them. The first big challenge Armstrong addressed was how to buy bitcoins easily. Back then, buyers and sellers gathered in parks or bars to trade cash for bits. Others wired money to brokers, often abroad, and hoped. It was hard to turn dollars, or any other currency, into bitcoins. Armstrong solved that by gaining access to the Automated Clearing House, or ACH, the electronic rails on which certain financial transactions run in the U.S. Employers use ACH to deposit checks in employee accounts, for example. To get on, a company needs a bank to sponsor it. Bitcoin companies struggle, Armstrong says, because banks worry that with bitcoin, you can’t know your customer and prevent money laundering, two things regulators require. Armstrong scored a banking relationship with Silicon Valley Bank in October 2012. A month later, customers could transfer money from a U.S. bank account to Coinbase and buy bitcoins. No muss, no fuss. Circle Internet Financial Ltd., a Boston-based bitcoin brokerage, also offers ACH transfers. In New York, Ehrsam had fallen under Nakamoto’s spell. It happened when a friend from Duke University, where Ehrsam had studied computer science, pulled up the white paper. Ehrsam read that and then everything else he could discover about bitcoin. “You could find nobody in person who could explain how bitcoin worked,” he says. He came across Armstrong’s work on the Internet. They corresponded, and Ehrsam started buying and selling bitcoins, sometimes on his phone from the bathroom at Goldman Sachs. “We traded it for fun and some profit,” he says. They hit it off, and Ehrsam joined Coinbase in November 2012, taking the title of co-founder. Back then, some 15,000 people had wallets on Coinbase, and they bought and sold about $1 million in bitcoins a month, Armstrong says. He and Ehrsam ran the thing by themselves out of a two-bedroom apartment in San Francisco. At the time, one bitcoin sold for about $13. People still used a whole one to buy a pizza, if they could find a shop that accepted it. The price of a bitcoin rose for most of 2013, peaking at $1,137 on Nov. 29. By year’s end, Coinbase had more than 600,000 users, and it got a further $25 million from venture capitalists, with Andreessen Horowitz putting in the biggest chunk. The success of bitcoin, and Coinbase, will depend in part on whether big merchants start accepting it. Armstrong and Ehrsam are pitching them. So far, they’ve convinced computer maker Dell Inc., travel company Expedia Inc. and software maker Intuit Inc. to take bitcoins and to open merchant accounts on Coinbase. The system will have to prove secure, too, for the general public to get on board. Bitcoin “manages to function in a very adversarial environment,” says Paul Kocher, president and chief scientist at Cryptography Research, a part of semiconductor designer Rambus Inc. By that, he means that everyone wants to attack it, because it’s money. Bitcoin uses something called public-key cryptography, which requires two keys, each a string of numbers and letters. One is public and identifies the sender or recipient in a bitcoin transaction. The other key is private and is used to verify, or sign, the transaction. Unlike a Facebook password, the private key can’t be retrieved with an e-mail if it’s lost. Once it’s gone, it’s gone. Bitcoin seems as futuristic as a light saber until it comes to keeping hold of the private key. Then it seems as ancient and clunky as gold. Fearing hackers, many people print out their private keys, delete them from their computers and put them in safes. Many a bitcoin has been lost to hard drives crashing, according to the U.S. Consumer Financial Protection Bureau. “For the average consumer, bitcoin is a risky proposition,” says Mercedes Tunstall, a partner at law firm Ballard Spahr LLP in Washington and an expert on data security. Hackers can get private keys off a person’s computer, she says, because people don’t protect them properly. Coinbase addresses that by keeping everything in house. Coinbase users never even see their private keys. They just have accounts with passwords, and those passwords are backed up with ever-changing codes sent to their phones. Coinbase, in turn, puts many of the bitcoins it holds in what the company refers to as cold storage. It splits individual private keys, writes them onto USB drives and prints them on paper, and puts everything in vaults and safety deposit boxes at various locations. No one person can retrieve the codes. Many bitcoin lovers, Ehrsam and Armstrong included, make endless comparisons between e-mail and bitcoin. One sends data, the other money. People freaked out about the security of e-mail in the beginning, and today they send all manner of private information electronically because it’s proved easy to use and secure, provided basic security protocols are observed. Armstrong and Ehrsam say the same thing will happen with bitcoin. The chance for merchants to avoid credit card fees of 2 percent to 3 percent and the ability to send money for free, anywhere, will attract more and more users, and more and more merchants, they say. What seems strange and scary now will become familiar, and bitcoin will go from curio to currency. That’s the bet Armstrong and Ehrsam are making, with deadly seriousness. They may not be on par with death and taxes, but rising ATM fees seemingly have become a fact of life. Average ATM surcharges and out-of-network ATM fees surged to new highs this year, according to the 17th annual Bankrate Checking Survey. The jump in ATM fees was a standout in the 2014 survey, which also saw record highs for overdraft fees and for some account maintenance fees. "ATM fees, overdraft fees, year in year out, the fees go up," says Greg McBride, CFA, Bankrate's chief financial analyst. But Bankrate's survey also offered some positives. Namely, checking fees that had been moving higher appear to be stalling. The same goes with the free fall in the number of free checking accounts. And consumers should remember: With a little planning ahead, there's no reason to ever fork over hard-earned cash for fees. Bankrate surveyed the 10 largest banks and thrifts in 25 of the nation's biggest markets from July 10 to Aug. 6, 2014. The average surcharge that banks charge non-customers who use their ATMs climbed 6.5 percent to $2.77, marking the 10th year in a row of increases for this fee. The average fee banks charge their own customers for going to an outside ATM also rose to a new high of $1.58. That means that, combined, consumers pay an average of $4.35 each time they use an out-of-network ATM. That's an increase of more than 5 percent from last year. "The ATM fees go up at such a rapid clip because it's really low-hanging fruit as far as fee income is concerned," McBride says, noting that the surcharge is a non-customer charge. McBride says ATM surcharges may even persuade a non-customer to open an account at the bank of an ATM they regularly use. "If a non-customer is always using a bank's ATM and getting dinged with the fee, they may just throw in the towel and become a customer of the bank." Mark Schwanhausser, director of Omnichannel Financial Services at Javelin Strategy & Research, says ATM fees are the price for not planning ahead to get to an in-network ATM or for choosing a bank that does not have convenient ATMs. "If you're going to use someone else's ATM, they have a right to charge you for it," Schwanhausser says. "Is the fee appropriate? That's where you start to have a debate." Both he and McBride say using apps or websites to find nearby ATMs, or using a debit card at a store and getting cash back, can help consumers avoid ATM fees. "Routinely incurring ATM fees is a sloppy financial habit, but it's one that can be fixed," McBride says. "You can plug the hole in the bucket just by limiting withdrawals to your own bank's ATMs." The dreaded and much-maligned overdraft fee, also known as nonsufficient funds fee, is on the rise again this year, Bankrate found. But the rise of 1.7 percent (to an average of $32.74) was less than the rate of inflation. "A lot of things ... in life go up," McBride says, adding that overdraft fees have been rising at a rate consistent with inflation for the past few years. "Laundry detergent goes up, but no one complains about it." Part of the reason overdraft fees get so much attention is they can drain consumers' accounts more quickly than ATM surcharges or other fees. Consumer vitriol against overdraft and other fees has, in part, led to fewer fees online or with mobile banking sites like GoBank, Simple or Moven, says Jim Johannes, director of the Puelicher Center for Banking Education at the University of Wisconsin. One easy way to avoid overdraft fees: Don't opt in to overdraft protection. That means debit card purchases that would overdraw an account would simply be declined. Opting out won't protect against overdrafts, but it can help to avoid fees. Consumers also should monitor their account balances and transactions. "Maintaining higher balances … reduces the need for overdraft protection," says Paul Gregg, who teaches personal finance and investments at the University of Central Florida. And with mobile apps and online banking, an account balance is never more than a click away. Unlike noninterest checking accounts, which saw the average balance requirements and monthly service fees fall from last year, the average fees for interest accounts actually rose in this year's survey. The average account balance required to avoid a fee increased 7 percent to $6,211, while monthly fees for customers who don't meet requirements nudged up 0.8 percent to a new high of $14.76. That makes interest checking accounts an even less attractive product, given that the average yield on such accounts hit a new low of 0.4 percent. "Why bother?" McBride asks. "Interest accounts are not worth the hassle. … The fees are higher, the balance required is higher. If you've got to strand a large amount of money in a (low-yield account) just to avoid a fee, it's time to make a change." Although rising fees can boost the cost of checking accounts, the vast majority of checking accounts are still free, although sometimes with an asterisk. Bankrate's latest survey found that 38 percent of noninterest checking accounts are free, with no monthly maintenance fees or other requirements. That's the same as last year and down only slightly from 39 percent in 2012. Only 4 percent of interest checking accounts are free. However, 97 percent of the accounts surveyed can be free if a consumer meets certain conditions. In other words, the majority of checking accounts waive monthly fees if a consumer keeps a certain minimum balance, uses direct deposit or e-statements, or meets some other requirement. "Having a direct deposit is … a convenience for the customer, but it's also something that makes it more difficult for you to disentangle from the bank," Schwanhausser says. The rising fees found in the Bankrate survey may, in part, be a move to recoup banks' overall revenue losses. Changes in government regulations and changes in consumer behavior have reduced revenue from these fees. A study by Pulse shows that ATM withdrawals per month per active card have been dwindling. That means fewer opportunities for out-of-network ATM fees. Meanwhile, fewer consumers are overdrafting their accounts, in part because of a 2010 Federal Reserve rule prohibiting banks from charging overdraft protection fees unless a consumer opts in. These and other changes have put a crimp on banks' noninterest revenue, causing some banks to raise overdraft and other fees in recent years. Data from the Federal Deposit Insurance Corp. show that the fees collected by U.S. commercial banks peaked in 2009 and have been falling since then, dropping more than 20 percent from $41.1 billion in 2009 to $32.5 billion in 2013. Still, McBride says he doesn't expect to see any dramatic spikes in average fees in the future to offset lost revenue. "The sharp decline in free checking and the run-up in fees as the result of regulatory changes has run its course," he says. Copper traders are the most bearish since September and hedge funds are betting on price declines as concern that Europe’s debt crisis is deepening drove the metal to the lowest this year. Eighteen of 33 analysts surveyed by Bloomberg expect the metal to drop next week and six were neutral, the highest proportion since Sept. 23. Fund managers and other speculators held a net short position of 2,808 U.S. futures and options in the week ended May 22, from net-long holdings of 4,833 a week earlier, Commodity Futures Trading Commission data show. That’s the first bearish bet since January. The metal slid the most since September in May as concern about Greece’s future in the euro and spreading of the region’s crisis grew. Economic confidence in the euro area dropped to the lowest in 2 1/2 years in May and consumer confidence fell to a four-month low in the U.S., data showed this week, while Chinese industrial companies’ profits declined in April. China accounts for about 40 percent of global copper use and Europe 18 percent. Copper fell 3.3 percent to $7,353.50 a metric ton this year on the London Metal Exchange and slumped 12 percent in May. It slid to $7,301 today, the lowest since Dec. 20. The Standard & Poor’s GSCI gauge of 24 commodities slipped 9.6 percent this year and the MSCI All-Country World Index (MXWD) of equities lost 2.2 percent. Treasuries returned 2.1 percent, a Bank of America Corp. index shows. About $4.5 trillion was wiped from the value of global equities last month and the dollar climbed to the highest level in almost two years versus the euro as the turmoil in Europe spread. The European Commission challenged Germany’s remedies to the financial crisis on May 30, calling for direct euro-area aid for troubled banks. An opinion poll showed May 30 most Greeks want to see the terms of a financial rescue revised, stoking fears the nation may default and be forced to exit the euro. While Germany helped the euro area avoid a second recession in three years in the first quarter, the International Monetary Fund predicts the region will contract 0.3 percent this year. An index of executive and consumer sentiment in the 17-nation bloc fell to 90.6 from a revised 92.9 in April, the commission said May 30. The Conference Board’s U.S. consumer index fell to 64.9 last month from a revised 68.7 in April, May 29 data show. Chinese industrial companies’ earnings declined 2.2 percent from a year earlier, the National Bureau of Statistics said on its website May 27. Still, China’s 8.2 percent growth this year will help the global economy expand 3.5 percent, the IMF estimates. Goldman Sachs Group Inc. still expects Chinese demand to drive copper prices to $9,000 in three months. Potential production losses may help sustain a supply shortage estimated by Barclays Plc at 158,000 tons this year. BHP Billiton Ltd. and Rio Tinto Group (RIO), the world’s biggest and third-biggest mining companies by sales, said last month they’ll ration capital spending because of costs. Codelco, the largest copper producer, produced 10 percent less metal in the first quarter as ore-grades decreased. Thirteen of 28 traders and analysts surveyed by Bloomberg said gold would gain next week and five were neutral. Futures on the Comex in New York rose 2.9 percent $1,612.50 an ounce since the start of January after climbing the previous 11 years. Five of 13 people surveyed expect raw-sugar prices to climb next week and the same amount predicted a drop. The sweetener slipped 18 percent to 19.10 cents a pound on ICE Futures U.S. in New York this year. Seventeen of 29 people surveyed anticipate higher corn prices next week, while 16 of 30 said soybeans will rise. Corn dropped 13 percent to $5.605 a bushel this year as soybeans advanced 10 percent to $13.3225 a bushel in Chicago trading. Oil prices breached records in euros and pounds and are approaching all-time highs in Indian rupees and Brazilian reais, raising the prospect that consumer demand will deteriorate, according to Morgan Stanley. The CHART OF THE DAY shows the cost of a barrel of Brent crude in dollars, British pounds, euros, Indian rupees, Chinese yuan and Brazilian reais, expressed as a percentage of the previous record in those currencies. The price rose to 79.28 pounds on Feb. 23, 2 percent higher than the previous record set in April. Oil climbed to 93.71 euros yesterday, compared with a high of 93.46 euros in July 2008. The International Energy Agency cut its 2012 global oil demand forecast for a sixth month on Feb. 10 as a “darkening” economic outlook reduced prospects for growth. Worldwide oil consumption will increase by 800,000 barrels a day to an annual 89.9 million barrels a day, the agency said, after the International Monetary Fund last month cut its global economic growth prediction. Europe accounted for 25 percent of global crude imports in 2010 and India 8.6 percent, according to BP Plc (BP/)’s Statistical Review of World Energy. Which is Over Priced? Oil or Gold? With commodities in general skyrocketing in price (or the dollar devaluing) is there any way to tell what the real value of something is? How much is it really worth? Is Oil overpriced? How about Gold? Is it overpriced? Looking at these commodities in the standard way it is often difficult to tell. We could look at the inflation adjusted price of Gold but that requires that we rely on the government stated inflation index. But that is just one way to look at the price by comparing it to U.S. dollars. We could also look at its price in Euros or at what the price looks like to the people in China or India. And each of those are based on the values of their currency and how much they are inflating. But a different way to look at it would be in comparison to the price of other commodities. Theoretically in an ideal world, if the supply of currency is inflating, then all commodities should increase equally. But in the real world that isn’t true. There are inequalities partially because money doesn’t flow equally initially. Eventually it will even out as traders arbitrage high priced commodities against lower priced ones. But how do you know which commodities are over priced and which are under priced? Very simply you just divide one price by the other to get a ratio. If we look at the ratio of Gold to Oil we will see how they relate without bringing dollars into the equation. Assume for a moment that an ounce of gold is exactly $1000 and a barrel of oil is $100. Lets look at how many barrels of oil an ounce of gold would buy. You can just as easily divide it the other way but the numbers come out messier. So we are looking at barrels per ounce of Gold. So if Gold is at $1000 /oz and Oil costs $100 per barrel it is obvious that one ounce of gold would buy 10 barrels of oil, right? We used the free market price of gold rather than the government fixed price of $35 / ounce. We also used the free market price of oil (called stripper) rather than the government fixed price for the period it was fixed. If we look at the ratio of Gold to Oil since 1946, the average turns out to be 14.771 barrels of oil per ounce of gold. Or 1 ounce of gold will buy almost 15 barrels of Oil on average. If we look at the average ratio during 2011 one ounce of gold would buy 18 barrels of oil or slightly more than normal. This tells us that either Gold was slightly expensive or Oil was slightly cheap (or both). Unfortunately, since we pay for things in dollars we can’t tell whether (in dollars) gold is too expensive or oil is too cheap. Back in 2008 when the ratio was less than 10 the ratio was the other way around with oil expensive and/or gold cheap. But this is where arbitrage comes in… what we could done if oil is cheap, is buy oil and sell gold hoping the ratio would move toward normal. That way if oil rises in price and gold stays the same you make money. If gold falls in price and oil stays the same you make money. If both rise in price because of inflation but oil rises more so the ratio normalizes you make money, etc. If could go back to 1985 and be given a choice to invest in Oil or Gold which would you choose? If you bought 4 ounces of gold in 1985 at $317.00/ oz and a ratio of 11.776 bbl/oz it would have cost you $1268. or you could have bought 47.10 barrels of oil. Three years later you could have exchanged your 4 oz of gold for $1748 and bought 117.55 Barrels of oil. So although your dollars increased by 37.8% your number of barrels of oil increased by 149.6%. Had you held your oil until 2000 when the ratio was back down to 10, your 117.55 barrels would be worth $3220.87 while four ounces of gold would only be worth $1116.44 or about $150 less than you had paid for it! In 1988 oil was extremely cheap at over 29 barrels per ounce. But if you had bought oil in 1986 at 25 (also very cheap) it would have appeared that you were losing money for two years until the ratio turned around. In 1998 Gold is $294.24 an ounce and Oil is $11.91 a barrel you have $1200 to spend… Which do you buy? Based on this chart at 24 barrels to an ounce of gold, Oil was cheaper. You could have bought 100 barrels for $11.91 x 100 = $1191 and sold them when oil was expensive in 2008 (once again less than 10 barrels per ounce. At that point you could have exchanged your 100 barrels for $9148 and bought 10.49 ounces of gold. Had you bought gold in 1998 you could have used your $1191 and bought only 4.047 ounces. Warning: Don’t just go out and start buying oil and selling gold based on this chart. We are using Annual averages for easy comparison. These ratios change on a daily basis. So you need much more up to date information than what an annual chart will tell you. As of today 2/17/2012 oil is $95/ bbl and gold is $1723.80 so the ratio is 18.145 barrels per ounce. So the price isn’t over 20 or under 10 so the price isn’t truly extreme but oil is slightly cheaper than gold. How High will Gold Get? Today, without much fanfare, US debt to GDP hit 101% with the latest issuance of $32 billion in 2 Year Bonds. If the moment when this ratio went from double to triple digits is still fresh in readers minds, is because it is: total debt hit and surpassed the most recently revised Q4 GDP on January 30, or just three weeks ago. Said otherwise, it has taken the US 21 days to add a full percentage point to this most critical of debt sustainability ratios: but fear not, with just under $1 trillion in new debt issuance on deck in the next 9 months, we will be at 110% in no time. Still, this trend made us curious to see who has been buying (and selling) US debt over the past year. The results are somewhat surprising. As the chart below, which highlights some of the biggest and most notable holders of US paper, shows, in the period December 31, 2010 to December 31, 2011, there have been two very distinct shifts: those who are going all in on the ponzi, and those who are gradually shifting away from the greenback, and just as quietly, and without much fanfare of their own, reinvesting their trade surplus in something distinctly other than US paper. The latter two: China and Russia, as we havenoted in the past. Yet these are more than offset by... well, we'll let the readers look at the chart below based on TIC data and figure out it. That the Fed is now actively monetizing US debt is beyond dispute (although some semantic holdouts remain - we are quite happy for them). Alas, with China, which has traditionally been the biggest buyer of US paper, no longer buying Treasurys, we are confident that the Fed will have no choice but to be dragged kicking and screaming once again into the fray, especially since traditional buyers of paper, even when allowing for exponential repo market leveraging (and someone please look at what is going on in the BoNY, State Street sponsored $15 trillion quicksand of repo'ed securities, which is the biggest black hole in the shadow banking system and will be the next pillar of the ponzi system to collapse) will be unable to keep up with US issuance. Especially since Primary Dealers already saw their Treasury holding rise to an all time high in the past week, and are loaded to the gills with US paper. So who is buying? Why Japan and the UK. Japan and the UK? Hmm, if these two names sound oddly familiar, allow us to refresh one's memory. Behold the pristine leverage condition of both these two countries, in all its glory. Hint: look at the far left. So somehow the world's two most indebted countries (recall that Japan is about to in total pass 1 quadrillion debt) are out there and buying up the biggest amount of US debt (after the Fed of course)? Sorry, but while we are amusing by this attempt by the global ponzi regime to keep itself alive (even as Russia and China prudently step aside from the mauling that is sure to follow), whereby the most indebted nations keep buying each other's debt in the most transparent and potentially deadly shell game in history, we are also confident this is unsustainable. Which means the Fed will have no choice but to step in. And since when it comes to the capital markets, the ride up is over since we have now crossed the point where incremental profits are drowned by incremental input costs (thank you $106 WTI), the Fed now has just one mandate: to keep the US fiscal machine well-greased by buying up US debt at zero (and beginning in May negative) rates, through wanton monetization. 2012 may prove to be quite eventful after all. LONDON, Feb 23 (Reuters) - Brent oil valued in euros set an all-time high on Thursday above 93 euros a barrel, beating 2008's pre-financial crisis high and adding fuel costs to euro zone debt troubles. Brent, a global benchmark for crude, rose to 93.60 euros per barrel, exceeding a previous record on July 3, 2008 of 93.46 euros. The record prices in euros, and also in British pounds, could further slow economic growth in Europe, where consumers are already being squeezed by tighter budgets due to widespread austerity measures and reduced availability of credit. Dollar-denominated Brent prices at just over $124 a barrel are still well short of 2008's record $147. The common European currency has underperformed the dollar because of the euro zone's debt crisis. "The recent strength of the U.S. dollar, the currency in which crude oil is traded, and the sharp rise in the oil price is likely to lead to further rises in the retail price of fuel in Europe and the UK and consumers can be expected to respond by trying to use fuel as efficiently as possible or by cutting back on non-essential travel," Caroline Bain, commodities analyst at the Economist Intelligence Unit, said. Data published on Wednesday showed unexpectedly weak activity in Europe's most powerful economy, Germany, and in France, sparking fresh worries the region could tip into recession. Risk sentiment towards the dollar has improved during the euro zone sovereign debt crisis, keeping a lid on the gains in crude prices denominated in the greenback. "The issues around the euro zone translate into a much stronger dollar so Europe as a whole is not spared the rise in oil prices as it was back in 2008, when they enjoyed the buffer that their currency provided in relation to the price rise in dollar terms", BNP commodity strategist Harry Tchilinguirian said. By 1222 GMT, Brent crude futures traded up $1.15 at $124.05 per barrel, having risen to highs not seen since May 2011 earlier in the session of $124.48 per barrel. Brent crude prices on a sterling basis climbed to historical records of 79.19 pounds per barrel. Tight crude availability due to tensions affecting producers Iran, South Sudan, Syria and Yemen, together with reduced output in the North Sea, have supported prices in dollars since the beginning of the year. High prices could be key to elections being fought both in the United States and in France, and there has been increasing talk of the possibility that oil will be released from government-controlled inventories to alleviate price strength. Sources told Reuters in January that the International Energy Agency has discussed a plan to release up to 14 million barrels per day of government-owned oil if tensions with Iran rise. "In Euros per barrel the price impact of the EU sanctions on Iran is greater than the impact of the total shutdown of Libya last year and the price spike is going to be a political challenge for politicians in the West running for re-election," Petromatrix's Olivier Jakob said in a note. However, Jakob warned that a strategic release would be more difficult to justify this year. A dollar collapse could be in the cards within a few months as new technical analysis shows the the reserve currency support eroding and within the parameters of uncharted territory. On Friday, March 25th, the dollar reached a low of 75.48 on the index. It had not fallen to that level since shortly after the credit crisis of 2008 ravaged both equities and the monetary system. Massive bailouts and Federal Reserve intervention helped the dollar to recover, and it moved past 80 on the index over the next two years. However, since the Fed also began implementing Quantitative Easing (QE) I and II, the dollar has been under a continuous assualt as the the total amount of dollars has increased, and inflation has moved at a very fast rate in the last six months. Technical analysis shows that before we reach the end of QE2 in June, the dollar could fall below the index level of 72, which is the lowest we have seen in the modern era of the dollar after President Nixon took us off the gold standard, and simply floated the currency as a pure fiat entity. What makes this dollar collapse possible is a number of fundamental factors on top of the technical ones we are seeing in M1 and M3. Foreign servicing of our debt has dropped off, and in fact, may go in reverse very shortly as Japan will sell treasuries to pay for basic needs and the rebuilding of their industry after the disasters this month on their mainland. Additionally, the US government is bankrupt, and now in a legislative debate on whether to raise the debt ceiling. Should Congress refuse to do this, then the US will not be able to sell debt instruments to keep the government functioning, and pay for the multitude of programs that are part of the nearly $100 trillion in unfunded liabilities. Foreigners are seeing that buying US debt is a losing proposition, and this is requiring the Federal Reserve to monetize our debt, and print money which devalues the currency. Already, the G20, IMF, European Union, China, India, Russia, and the oil states are growing the talks to replace the dollar as the world's reserve currency, and instead replace it with IMF controlled Special Drawing Rights (SDR's). Should the dollar collapse as projected, then the implementation of a new world currency would accelerate in scope, and be accepted fairly quickly by the global economy. 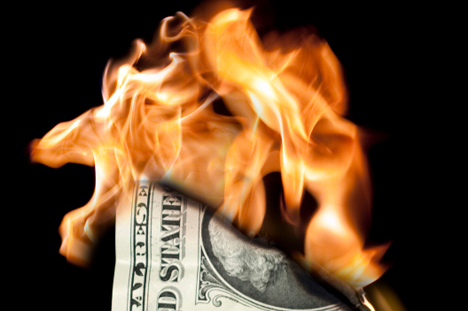 Logically, a dollar collapse within the next few months is not very likely, but logic has been throw out the window as the US and the Federal Reserve continue to print dollars and devalue the currency almost daily. Much the Middle Eastern protests over food this last month has occurred because the dollar has devalued, and caused massive havok on world food prices, and other commodities. All one has to do is look at oil, gold and silver, corn, wheat, cotton, and other food materials to see that there is one common denominator behind their rise, and that is the continuing fall of the dollar. While logically a dollar collapse is not likely, technically it very well could happen within the next three to four months. If the US and the Federal Reserve continues down the path we instituted in 2008, and grew under QE2, then all it would take for the dollar to become worthless is one or more new world disasters to take place that would bring down, or lock up the global economic system. We are not done with events in the Middle East, and have yet to see the consequences of shutting down Japan's export and economic contributions to world markets, but when they arrive, the dollar could very easily fall into uncharted waters. Global markets tumbled Tuesday, dragged down by rising concern that the high cost of raw materials is eating into tight business and household budgets and undercutting prospects for economic growth. Crude oil fell 3.3%, leading a broad reversal of the rally that had recently sent prices for copper, cotton and other commodities to record highs. 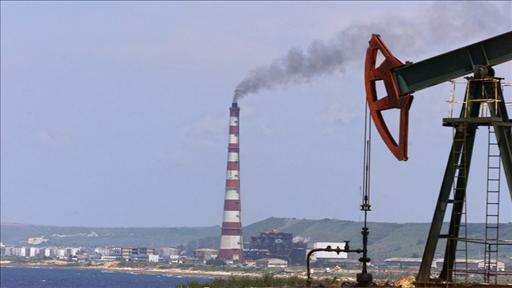 Oil prices have now dropped 5.8% this week, after spiking in recent months amid Middle East unrest. Oil futures fell 3.3%. 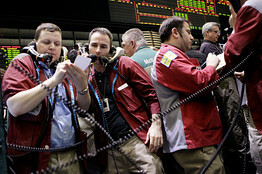 Above, raders work the crude oil options pit at the New York Mercantile Exchange April 12. Oil's dip came after the International Energy Agency, which represents big oil-consuming nations, and the Organization of Petroleum Exporting Countries both reported that demand is weakening amid high prices. Saudi Arabia has cut back production after ratcheting it up just a few weeks ago amid fighting in Libya, another major exporter. Crude oil on the New York Mercantile Exchange settled on Tuesday at $106.25 a barrel, though prices are still up 16% this year. Stocks also dropped broadly. The Dow Jones Industrial Average fell 0.9%, its biggest daily drop in almost a month. Renewed worries about contamination from Japan's damaged Fukushima Daiichi nuclear-power plant also weighed on stocks. Tokyo's Nikkei stock average dropped 1.7%, Hong Kong's Hang Seng index lost 1.3%, and Germany's DAX declined 1.4%. Surging prices for raw materials have been stoking rising fears of inflation in recent months. But Tuesday's simultaneous drop in stocks, oil and other basic goods underscored another immediate threat: that commodities have become too costly for cash-strapped customers still contending with high unemployment. Government data released Tuesday showing that U.S. exports fell in February for the first time since August contributed to the worries and led many forecasters to reduce their economic-growth projections. ""The potential for a slowdown in the global growth story has finally come to fruition," said Jay Wong, principal and equity portfolio manager at Payden & Rygel. "I'm not saying we're going to get a recession, but if you look at the range of growth estimates for the year, people are coming in more toward the bottom of the range. It looks like expectations are on the muted side." Macroeconomic Advisers, a forecasting group, cut its projection for first-quarter gross-domestic-product growth from 2.1% to 1.5%, while Morgan Stanley analysts reduced their forecast from 1.9% to 1.5%. The government will release first-quarter GDP data April 28. Jonathan Cheng explains why oil prices slid very sharply today back to $106 a barrel and stocks tumbled on concerns about Japan, energy and Alcoa. For investors still struggling to gauge how the devastating earthquake in Japan and the continuing Middle East turmoil may affect growth, the tepid trade data offered an early sign of the economy's persistent fragility. The negative economic indicators, and words of caution from the IEA and OPEC, came as investors were already digesting the recent commodity rally and weighing whether to take profits. Goldman Sachs Group Inc., a commodity bull among Wall Street banks, on Monday recommended that clients sell a basket of commodities that had risen sharply in recent months. Prices for the handpicked basket, consisting of crude oil, copper, cotton, soybeans and platinum, had surged 25% on balance since Goldman recommended buying the commodities in December. The basket hit Goldman's return target eight months earlier than expected. "Even though we have not changed our fundamental views, prices have moved rapidly," David Greely, head of energy research at Goldman Sachs, said in an interview Tuesday. Tuesday's reversal also hit a range of commodities beyond oil, as investors sold out of hard assets that have benefited for months from low interest rates and lingering fears of financial turmoil. Copper prices dropped 1.7%, wheat plummeted 4.9%, cotton shed 2.4%, and gold prices dipped 1%. "A lot of people are doing the exact same thing" as Goldman Sachs by concluding it is time to sell their own commodity basket, said Nicholas Johnson, co-manager of Pimco's CommodityRealReturn Strategy Fund. Even with the declines, many raw materials still cost significantly more than they did as recently as year end. Corn, for instance, is up 20% this year. "We are still very positive on many commodities on a fundamental basis over the long run," Goldman's Mr. Greely said. In its monthly report, OPEC cut its world oil-demand-growth forecast for 2011 by 50,000 barrels a day, though it still forecasts world-wide demand to grow by 1.39 million barrels a day in 2011. OPEC said U.S. gasoline sales fell by almost 1.3% in January, as people drove less and bought more efficient cars to make up for higher fuel prices. The IEA, meanwhile, on Tuesday kept its global oil-consumption estimates for 2011 unchanged but warned that "preliminary January and February data suggest that high prices are already starting to dent demand growth." 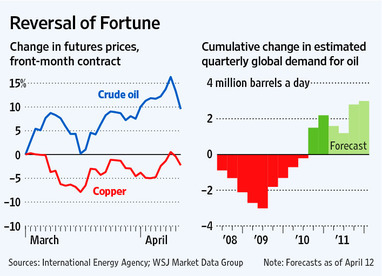 High oil prices may pose the greatest threat to global growth. U.S retail gasoline prices rose 11 cents last week, to $3.79 a gallon, inching close to the level of $4 a gallon economists say will lead to cutbacks in spending by consumers. Diesel fuel, a key transportation cost, already is more than $4 a gallon. In the first quarter, average gasoline prices in the U.S. rose 20%, which translates into an additional expense of about $150 per household, or a total increase in gasoline expenditures of $17 billion during the quarter, the Federal Reserve Bank of Dallas said Friday. Businesses paid an extra $1.2 billion a week on imported petroleum over the same period of 2010, the bank said. —Jerry A. DiColo contributed to this article.